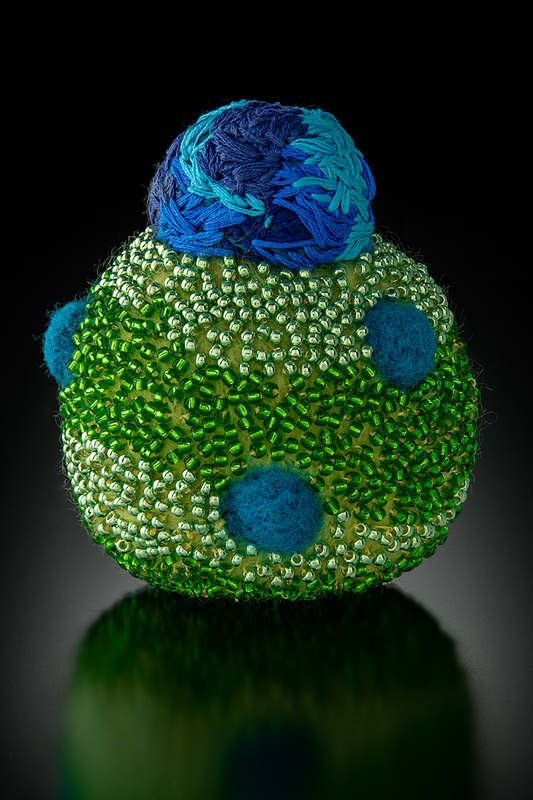 Mutation 2016, bead embroidery and needle felting, Photo Credit: Larry Sanders. I think it is too late for me. I am already taking the entire event too seriously. Tuesday I am scheduled to fly to New York for the opening of my exhibition at Clio Art Fair. While I’ve been in scores of exhibitions, this one feels different. It will be the first time I’ve flown since my stroke. I have no idea if I will get a huge headache as a result. I’ve invested considerable money to participate. I thought it might be helpful to provide a list and timeline for others and to remind myself for the next one. I started 4 months out. I already had most of the work made, I simply needed to get some of it photographed, like Mutation above. Announce show on your website two months in advance. Send out sneak peaks of work on social media once a week minimum for the two months before the show. Think of responses to common questions that will keep the conversation going. Print postcard of new work, with statement on reverse side - made 3x5” so it can fit in a pocket easily and not get lost in the shuffle. Personally invite friends and collectors in the area to attend the opening. Arrange for housing one month in advance of show. Buy plane ticket one month in advance of show. Ship art to arrive at warehouse at requested time, make sure you add ALL installation fixtures and that art is clearly marked. Get all the little toiletries so you don’t have trouble. Take passport out of bank vault as Missouri driver licenses may or may not be taken as ID by TSA. Better safe than sorry. Figure out onflight knit or crochet project that is small and portable. The afghan won’t do. And the one that has caused me the most angst, create a clothing list to fit in a small suitcase, with enough interchangeable clothes for a week and to cover a widespread of temperatures 47-80 are the predicted temps! For great how to pack light tips. I’ve been growing…. I’ve hit that age when hormonal changes cause weight gain. None of my clothes fit. My summer clothes had been worn to shreds, try looking for summer clothing in the Midwest in October! Note to self, don’t let your closet get to that level of disfunction again. I needed everything from underwear to shoes. It’s been expensive and not fun to shop in such a last minute rush. It is a ton of little things to keep track of. I may be obsessing, but I want everything to be perfect.